We do some fun hands-on projects for our colonial unit. I've blogged previously about the shop signs. 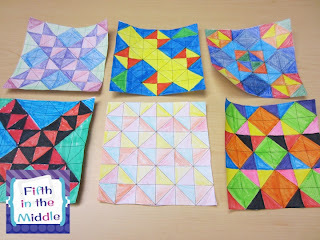 Each student also does a little quilt square that I assemble into a class quilt. 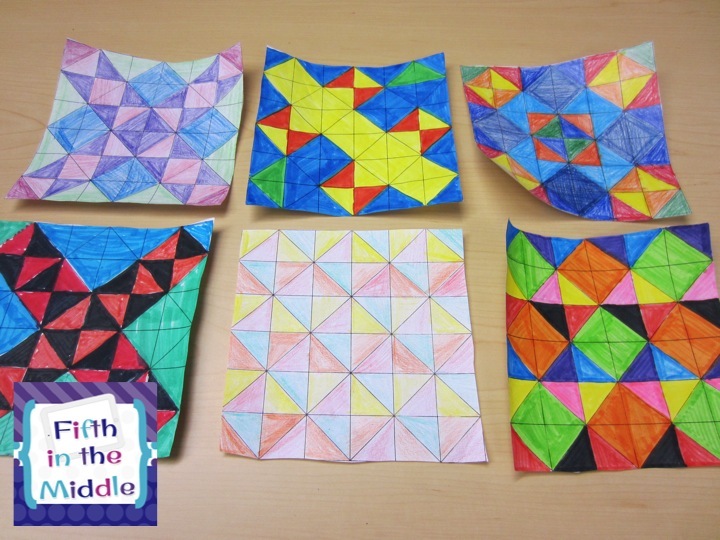 They have to find some sort of pattern in the square and color it accordingly. I have a fun at-home activity where students talk with their parents on why they got the name that they did. 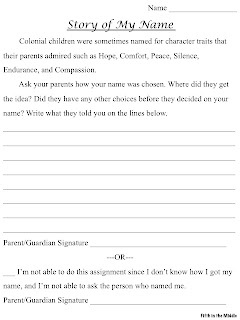 Some students already know how, but they have to get a parent/guardian signature in order to get full credit. Click on the picture to get a free copy. 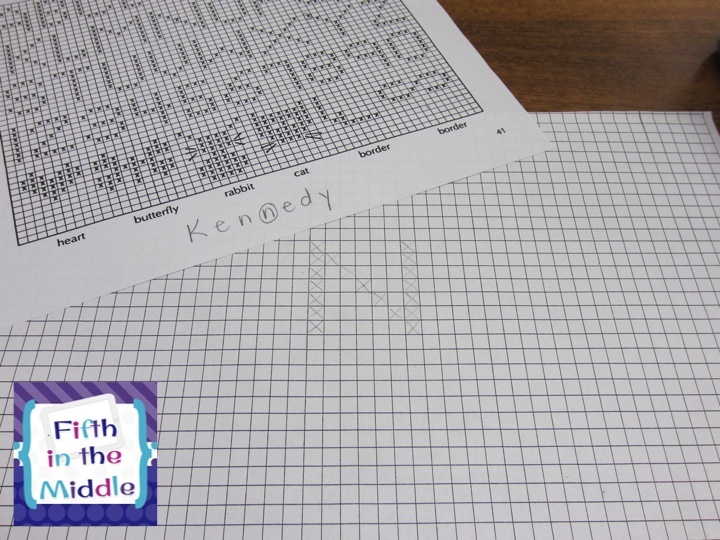 Then I have the students make name samplers with graph paper and markers. I also have a modified cross stitch pattern for reference, as well as other designs that past students and I have created. The first step is to figure out the middle letter of the name to be used. 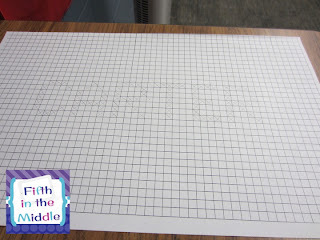 Students use a pencil to lightly make X's in the squares to form the letter. 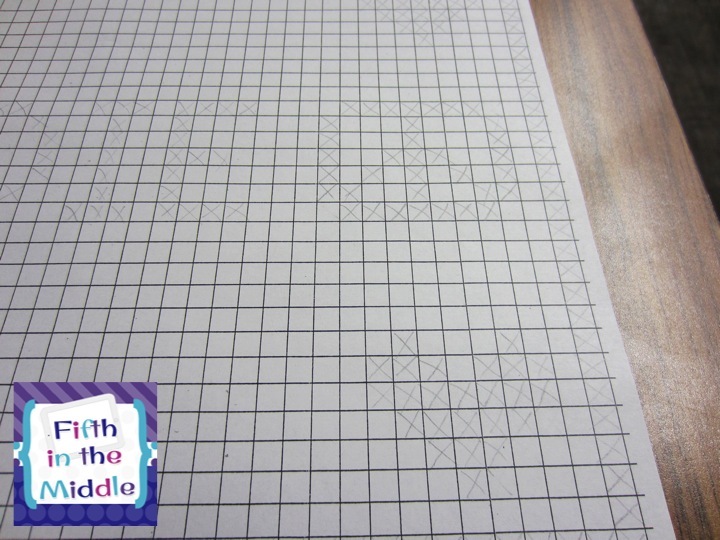 I pre-marked the middle square on their graph papers with a tiny dot. This is what it looks like. 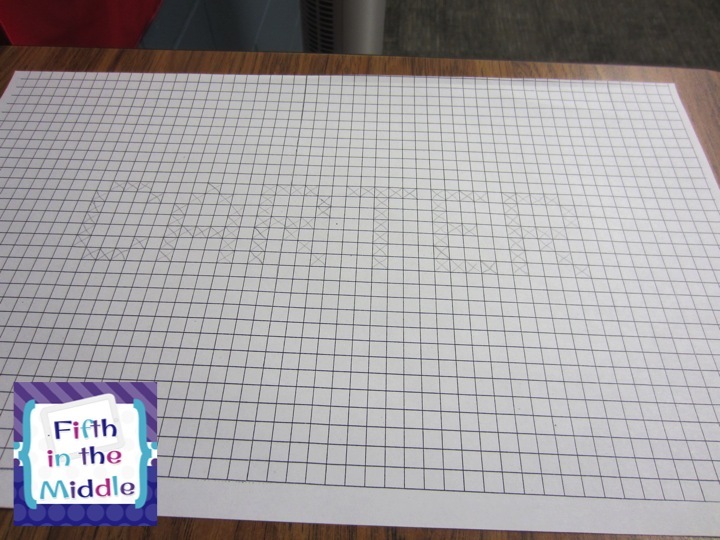 Then working from the middle, students lightly X in the rest of their letters, like this. This is where the headaches occur, as some kids totally get it, and some totally don't. Their letters are uneven and randomly spaced, which makes my brain hurt. When they have their names complete, I have them add additional designs. This one has a heart and a peace sign. 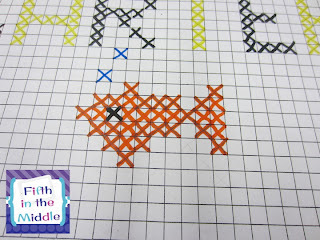 Then they trace over the X's with a fine tip Crayola marker. I have a stash that I use just for this activity. That way the tips stay nice and fresh. Every year I add to this stash when Target has their Crayola markers at $1.00 for back to school. For all of you Duck Dynasty fans. 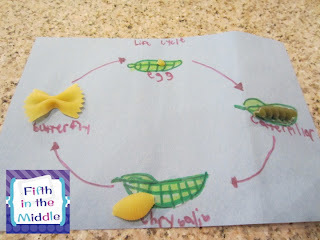 Here is a cute butterfly life cycle project that my daughter brought home. Each stage is a different kind of pasta! Cute! While you are visiting Amanda's, make sure that you enter her giveaway for a new classroom theme pack! 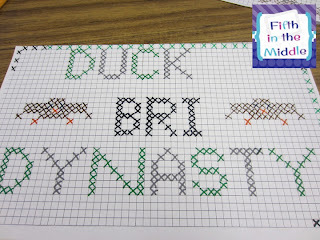 I love the cross-stitching! I would love to do a 'story of my name' with some of mine! That's a great idea! :) Found you through Doodlebugs linky! That cross stiching idea is great. 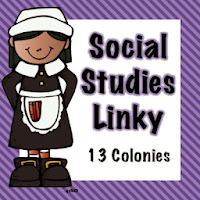 I'm going to pass it along to some of our grades that work on pioneers. Great post. What a neat idea! I love hearing about how the parents chose their child's name. What a neat idea! Where did you find the sampler of the letters? Thanks. Funny you should mention that... I'm working on putting all of this together into a craftivity packet. Stay tuned! But to answer your actual question, I don't remember. I'd have to check the sheet to see if it says. I plan on adapting it because I don't like many of the letters and shapes.